Ice fishing is, no doubt, one of the most interesting things any angler can enjoy doing. However, without the right equipment, it might be nearly impossible to make some solid finds. This is where Ice Fishing Flashers come in handy. They do an incredible job of analyzing what happens in the water beneath you. And that way, you can make more accurate decisions and, probably, land bigger and better catches. Sounds like something you’d like to use? Well, the only hurdle you need to overcome is one of ensuring that you get the best ice flasher available. And since the markets are full of options, we have conducted an unbiased review of 10 top alternatives worth pondering upon. Each one of the 10 has their own pros and cons, which we have also shed more light on. Don’t want to have to wait for the right weather to begin fishing? Choosing any one of the following best-rated ice flashers would ensure your winter trips pay off. 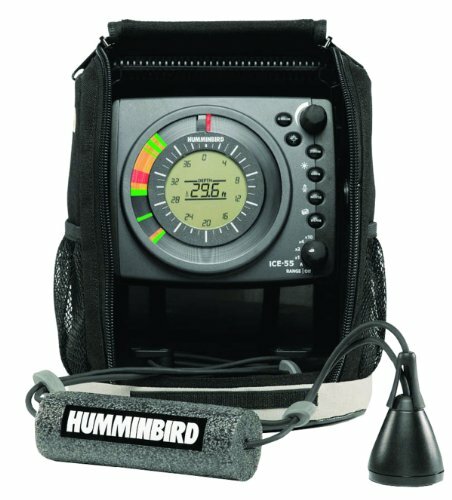 Humminbird is known for their prowess in producing the best fish finders on the market. So, how good are their ice flashers? We investigated. To begin with, the flasher boasts a dual beam sonar. This way, you get the freedom to choose between a wide and narrow beam. Ultimately, you pick the beam that provides you with the best coverage area. So, typically, you can use the Ice to identify all sorts of structures and even contours. And it goes without saying that this would make your ice fishing expedition more rewarding. In line with the standards set by other Ice Flashers, this one comes with a 3-color flasher display. That’s alongside a 2X dynamic zoom. If it’s good user-experience you’re looking for, we think this unit would not disappoint. That said, our concern is that its carrying case isn’t 100% waterproof. So, you’d need to be extra careful while using this unit out there. This handy ice flasher comes with a 12-volt battery pack with charger. On top of that, it packs an ice-ducer transduce which helps you capture signals remotely. Another awesome aspect of the FL8se is that it comes with three color beams. These are Green for weak, orange for medium, and red which represents a strong signal. You’ll also be glad to learn that this gadget can be used in different situations. 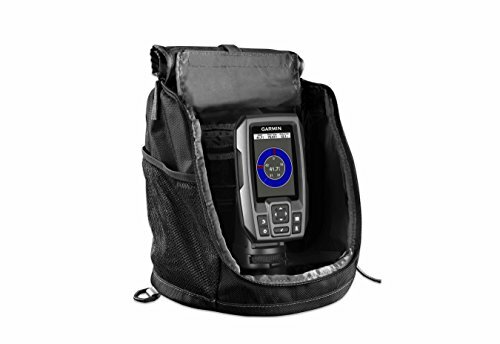 So, whether you’re fishing in shallow waters of 20-feet deep or exploring up to 120-feet deep, this device has got your covered. Its size is particularly enhanced for outdoor use. Its base, in particular, fits a 5-gallon bucket and is designed with an easy-to-access battery compartment. To crown it all up, the FL8SE comes with user-friendly knobs which enables you to adjust different aspects ranging from gain to mode and range. This is an amazing and user-friendly ice flasher. One thing that stands out about it is that it lets you fish comfortably from the shore. So, it doubles up as a fish-finder. But unlike other basic finders, this one comes with the built-in capability to check the water temperature. Also, just like a well-made ice flasher, it can also read the depth of the water. We can also add the fact that it comes with a casting range of 330 feet which is quite vast. The icing on the cake is that it’s so tiny that you can conveniently carry it in your back pocket. So, if you’re looking for something that you can take with you everywhere you go, this is it. And believe it or not. It also comes with a mini-USB port which can be used to charge it up. 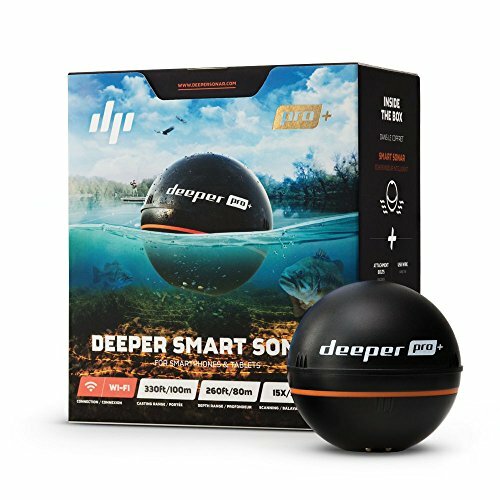 As far as performance is concerned, the Deeper Smart Sonar does a stellar job of presenting you with meaningful data. In fact, it can be automatically switched to the WiFi mode for even more precise fishing information. The first thing you’re likely to notice about the LX-9 from Marcum is that it’s pretty easy to assemble. And in case you still have challenges with this, the manual comes in handy. Generally, this flasher feels sturdy although it has numerous features as well. For instance, it has a vertical graph, chart sonar, and the traditional flasher – all-in-one. Its screen is also pretty large and crisp. On top of that, you’ll find the navigation menus to be pretty easy to use and handy. This will prove important when you need to change multiple settings on-the-go. As far as performance is concerned, we think this unit does a pretty good job within the 10 feet to 30 feet depth range. Otherwise, past the 30 feet mark, the details seem to get a bit sketchy and you might have difficulties detecting your jig. Another qualm with this flasher is that its camera’s resolution is quite low. Being a 2.0MP piece, its images even under perfect lighting seem pretty shady. You can, however, counter this by bringing you GoPro with you to counter this tiny issue. The LX-7 is a pretty popular ice flasher, judging from the number of reviews posted about it so far. And it’s easy to see why this is the case. To begin with, it comes with an 8-inch LCD screen which delivers incredible images. With a screen resolution of 800x600 pixels, you get above-average images. On top of that, this unit boasts a built-in sonar engine. At an optimal performance, the LX-7 enjoys a peak power of 4800 watts. It also gives you the freedom to reach depths of up to 300 feet. 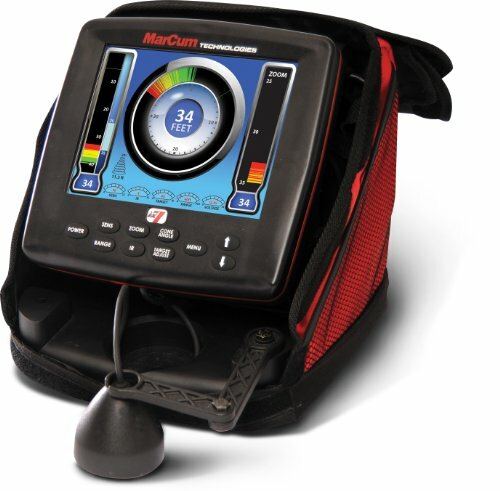 Another thing, the Marcum uses the popular Sonar Footprint technology to provide you with an in-depth 3D coverage. 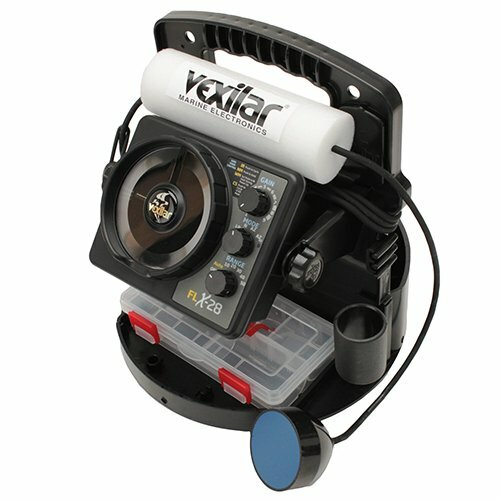 Another one from the Vexilar family is this eye-catching ice flasher. To begin with, it comes with a myriad of features starting with stuff like Auto Range, digital depth, battery status, and zoom zones. On top of that, you get 5 color palettes. What is that? Well, with more color palettes you can a maximum visibility even in extremely deep ocean waters. Lastly, this power efficient ice flasher boasts an excellent flat screen and an auto-ranging technology. If you’ve been angling for long, you probably have an idea what the FL-18 is all about. That’s because it has been on the market since 2001. And without a doubt, it remains one of the best ice flashers under 500. The single-frequency unit is designed to operate at 200 kHz. In fact, its transducer features a handy 7-foot cable which delivers a great level of performance in the water. On the flip side, though, it lacks a temperature sensor. Therefore, it doesn’t indicate the water temperature. Known for its dazzlingly bright and crystal clear images, the LX-5 is, no doubt on the most powerful flasher systems ever built. In fact, you can even use it to differentiate between fish, baitfish, and vegetation. That’s because all results are transmitted in a commercial-grade quality. One thing this unit is known as is the quality of its screen. It comes with vivid TrueColor technology which showcases all the finest details possible. Moving on, the LX-5 is one of the best ice flashers with a touch-key operation. So, if you’re looking for a modern system that leverages on modern technology, this has got to be it. The FL-12 from Vexilar is known for its ability to capture a great deal of detail under water. Besides that, it has a super bright LED screen which works perfectly in both bright and dark conditions. 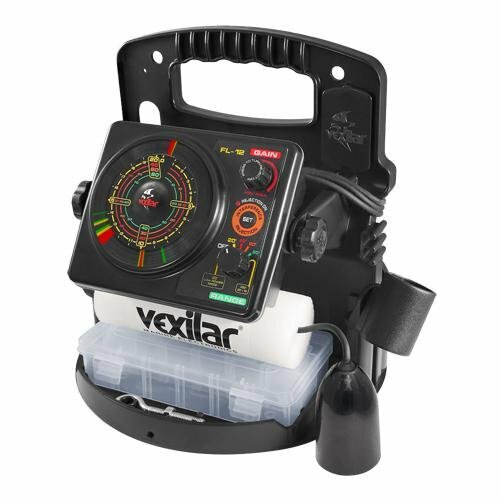 The performance of the Vexilar unit is further enhanced by the presence of its three-color sonar. The sonar is indeed, reputed for its ability to deliver a great deal of detail. And the icing on the cake, you get 6 depth ranges. Therefore, this would be a great flasher for shallow and deep waters alike. This is an awesome, multipurpose unit since it can be used for ice fishing as well as stationary fishing. The Striker 4 boasts a dual frequency Sonar which is also categorized as a CHIRP 2D sonar. One thing you need to know about CHIRP sonars is that they’re known for adding quite some power and clarity to images. Therefore, whenever you put such a unit to use, you’d end up with better-defined targets. Indeed, sometimes that’s all it takes to have less clutter on the screen. Lastly, the Striker offers an excellent target separation. This makes it extremely easy to spot small targets. Oh, and did we forget to mention that the unit is also IPX7 waterproof? That means it can typically survive water splashes and sporadic rains. We understand that it must be a tough challenge to choose the best ice flasher especially if this is your first time and have a short span of time to decide. So, just to make sure you’re making the best decision possible, here’s a run-down of the features you need to think about. Most ice flashers offer a 3-color display which is enough to get the job done. However, if you can find a unit that offers a greater color variety, you certainly would have a better experience. While at it, make sure your unit of choice provides a user-customizable display. The transducer is extremely important because it is the one that gathers all the data for you. So, it’s important to go for one that delivers accurate and meaningful information. You want to invest in something that’s compact and solid. The flasher should generally feel sturdy and be capable of surviving accidental water splashes and rain. Most importantly, it should be portable and built with work well even in snowy conditions. 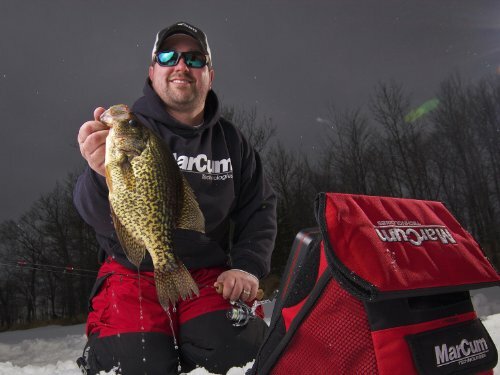 We’d settle for the Marcum LX-7 Fishing Sonar for Ice Fishing. It’s handy, compact and highly efficient. Most importantly, it has a pretty powerful signal and a well-made carrying bag. From our analysis, we found it to be well-suited for different outdoor environments. 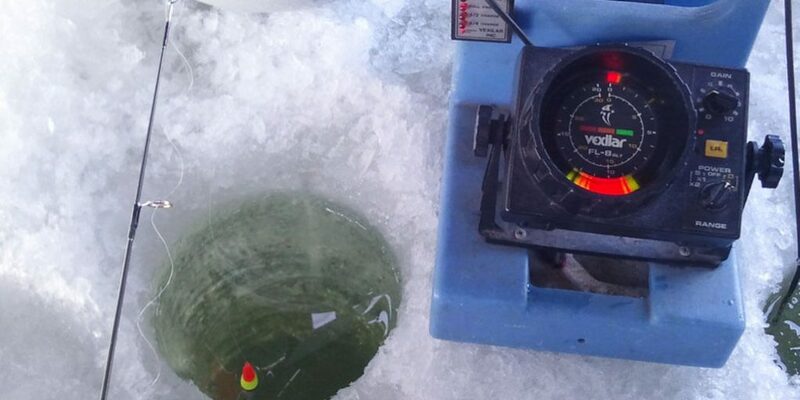 Your chances of catching more fish will double or even quadruple if you use the right Ice Flasher. In order for that to happen, though, you need to make sure you’re investing in the best flasher on the market. It’s our hope that the 10 reviews above will help you arrive at an informed, high-value choice.